New Antiquity is a full-service design build firm, specializing in bespoke cabinetry, millwork, furniture, architectural metal, and renovation work for residential and commercial projects. Based in historic Litchfield County, CT our shop boasts a full array of traditional and modern CNC woodworking and metal fabrication equipment allowing us an unlimited range of aesthetic possibility. We offer custom design services, art direction, interior styling, and on site work for all projects. Our background in both fine art and construction gives us a unique perspective and resourcefulness. Over the years our team has garnered a reputation for creating one-of-kind spaces and pieces that feel refreshingly modern and timeless. Drawing on our craft based practice, combined with our background in metal fabrication, New Antiquity is a one-stop-shop for commercial millwork and fabrication. Our portfolio of work ranges from single bespoke restaurants and breweries, to co-working-office spaces, to multi-unit chain restaurants and developments. While we do offer design services and shop drawings for all of our projects, New Antiquity enjoys collaborations with Architects and Designers on exciting projects nationwide. Whether you are renovating a classic New England colonial or a contemporary farmhouse, our timeless designs are tailored to fit the feel and style of your home. Our kitchens are designed and built from the best quality raw materials in our workshop; dovetailing old world craft techniques with the accuracy and efficiency of modern equipment. Cabinets are sized and configured around the flow of your daily life, we never use stock sizes, and strive for a built-in look that blends seamlessly into your home. As second generation woodworkers with New England roots dating back hundreds of years, quality craftsmanship and construction is in our blood. Our Woodbury, CT based company is surrounded by some of the best examples of carpentry mastery in the country, which fuels our sense of design and inspiration. As fully licensed and insured home improvement contractors with a solid crew of experienced carpenters and cabinetmakers, we welcome projects from framing through finish. In wood, metal or a combination of the two, handmade bespoke furniture is the cornerstone of our business. Nearly all of our projects involve single or multiple pieces of complex handmade furniture and casework. A reputation built on craft and attention to detail has allowed us to build our business into what it is today. These pieces, large or small are what we enjoy most about what we do everyday. Matt Rink and Sarah Bader, husband and wife, artists and builders reside and operate New Antiquity from breathtakingly beautiful Litchfield County. They both attended Alfred University in Upstate New York, each receiving a BFA in sculpture, metal working, woodworking, and photography combined. Matt obtained his MFA in design and sculpture from Clemson University in South Carolina. 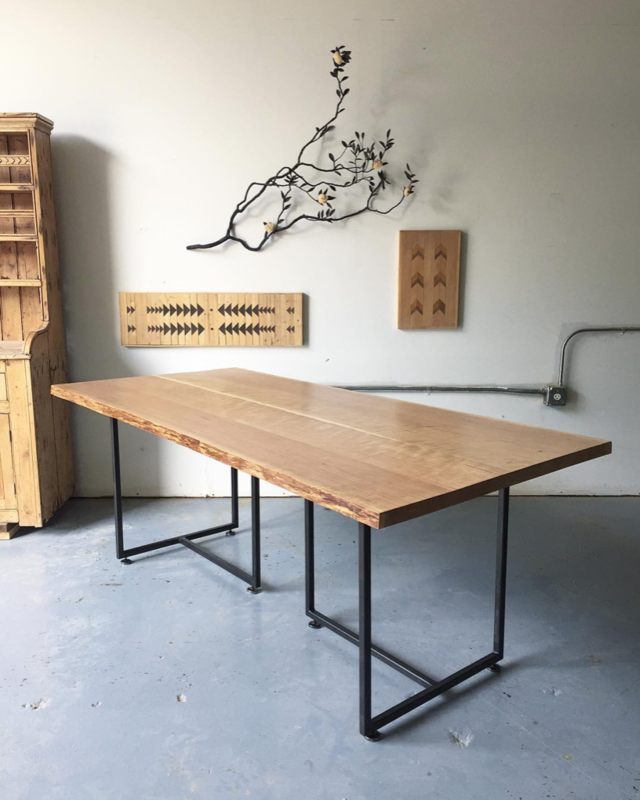 What began as an exciting collaboration, building furniture for their apartment and wedding, swiftly grew into a full time business as they discovered the possibilities in the confluence between functional and fine art. Matt and Sarah draw inspiration from the landscape and history around them, creating designs that are purposeful and transformative. All their creations are built and designed with clever details and fine craftsmanship that is both practical and whimsical. drop us a line to discuss your next project!